Temple. 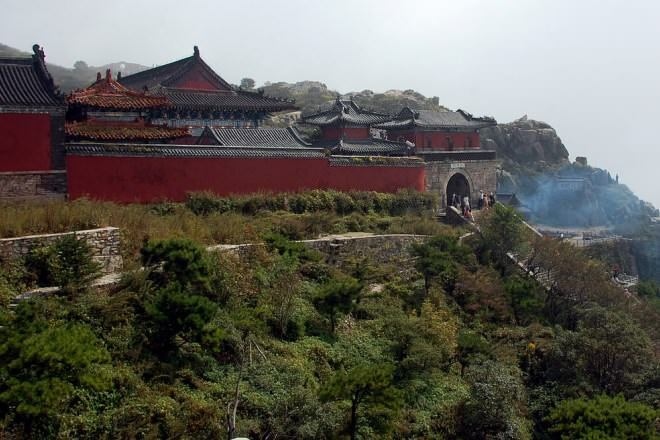 Taoist monasteries, temples, shrines. 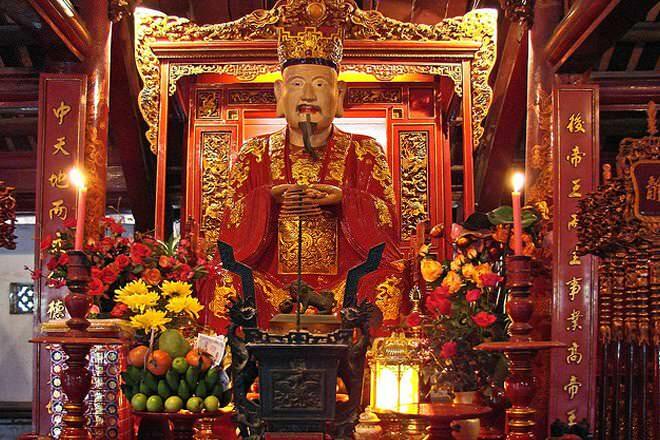 Visit to temples to pay homage to Ti'en(God or Heaven), Confucius, and ancestors; To practice ('Jing zuo, ') or 'Quiet Sitting Philosophical maturity, virtuous conduct, internal alchemy, and some sexual practices. To have a structured society. To be one with the Tao. One God. Ancestors also worshipped, though. Tao literally means the Way, which indicates the movement of a dynamic existence that is composed of opposing forces. Taoists do not believe in a personal God. To be worshipped as ancestors. If immortality isn't attained during life, the Tao will continue to evolve and manifest in different forms, in accordance with the entity's general conduct during a state of existence. This applies to all sentient and insentient beings. Disciple of Confucius. To follow the Tao. Humans should respect those who are superior to them. If humans are in tune with the Tao, their sufferings will cease. Taoism teaches that humans are capable of experiencing immortality. Bureaucrats. Taoist clergies are led by the daoshis, masters of the Tao, and followed by daojiaotus, followers of Taoism who also support the clergy, although it is not common. Analects of Confucius and Mencius; I Ching; Doctrine of Mean, etc. Daozang, a collection of 1400 texts organized in 3 sections which includes the Tao Te Ching, Zhuang Zi, I Ching, and some others. Buddha is followed by many Confucians. Some Taoists argue that the Buddha was a student of Lao Tzu, although there is no concrete evidence for it. Most Taoists respect and follow the Buddha's teachings. Confucianism is all about the brotherhood of humanity. The Tao is the only principle. The rest are its manifestations. Socially inferior to men. No distinctions between men and women, as both are seen as manifestations of the Tao. Social Harmony. To gain balance in life. Asia. China, Korea, to lesser extent Vietnam and Japan. Confucianists see no contradiction in following more than one religion. Taoism teaches that all religions are as anything else; manifestations of the impersonal Tao. Chinese New Year, Teacher Day, Ancestor Day. Chinese New Year, 3 Day Festival of the Dead, Ancestor Day. Can atheists partake in this religion's practices? Most believe in One God. Being manifestations of the Tao, Gods are seen as higher life forms. Confucianists usually follow Buddhism, which is a Dharmic religion. Taoism has many similarities with Buddhism. Taoists are neutral against other Dharmic religions. The core philosophy of Confucianism is that rules and rituals are needed to correct the degeneration of people. The core belief of Taoism is that there is a natural harmony between heaven and earth, which can be discovered by anyone. 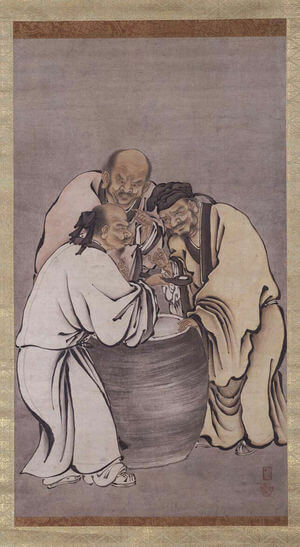 Vinegar Tasters is a common subject in traditional Chinese religious painting. It shows the Buddha, Confucius and Lao-Tse (aka Laozi, the author of Tao Te Ching) around a vat of vinegar. All three men have tasted the vinegar but react differently to it. Confucius finds it sour, Buddha finds it bitter and Lao-tse finds it sweet. To K'ung Fu-tse (kung FOOdsuh) [Confucius], life seemed rather sour. He believed that the present was out of step with the past, and that the government of man on earth was out of harmony with the Way of Heaven, the government of the universe. Therefore, he emphasized reverence for the Ancestors, as well as for the ancient rituals and ceremonies in which the emperor, as the Son of Heaven, acted as intermediary between limitless heaven and limited earth. Under Confucianism, the use of precisely measured court music, prescribed steps, actions, and phrases all added up to an extremely complex system of rituals, each used for a particular purpose at a particular time. A saying was recorded about K'ung Fu-tse: "If the mat was not straight, the Master would not sit." This ought to give an indication of the extent to which things were carried out under Confucianism. To Lao-tse (LAOdsuh), the harmony that naturally existed between heaven and earth from the very beginning could be found by anyone at any time. ... As he stated in his Tao Te Ching (DAO DEH JEENG), the "Tao Virtue Book," earth was in essence a reflection of heaven, run by the same laws—not by the laws of men. These laws affected not only the spinning of distant planets, but the activities of the birds in the forest and the fish in the sea. According to Lao-tse, the more man interfered with the natural balance produced and governed by the universal laws, the further away the harmony retreated into the distance. The more forcing, the more trouble. Whether heavy or light, wet or dry, fast or slow, everything had its own nature already within it, which could not be violated without causing difficulties. When abstract and arbitrary rules were imposed from the outside, struggle was inevitable. Only then did life become sour. Thanks for the Info! Really Helped me out! Thank you very much for these information. There are very useful for my studies. why does the chart say two things about the original languages?????? ?